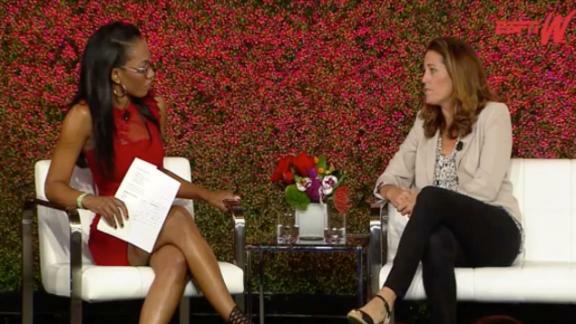 Cari Champion of espnW sits down with three-time United States Olympic soccer medalist Julie Foudy to talk about equal pay for women. CHICAGO -- The U.S. Soccer Federation disclosed financial data this week that disputes claims the women's national team is compensated unfairly in comparison with the men, and says its data was misinterpreted in the federal complaint filed by five stars of the World Cup championship team who have charged their employers with wage discrimination. "Some of the financial information that's been provided has been either inaccurate or misleading," USSF spokesman Neil Buethe said. "We wanted to share this information to help provide clarity." 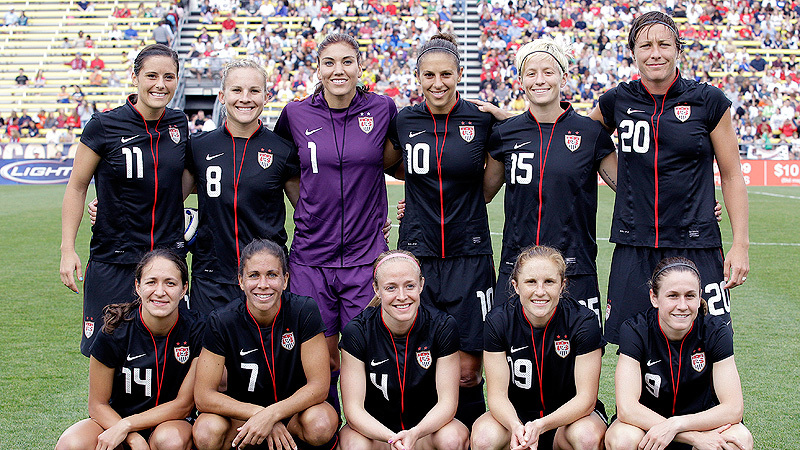 While the women in the filing say they have earned nearly 25 percent less than their male counterparts this year, the figures supplied by the USSF show that for the 25 top-earning U.S. national team players over the past four years, 14 of whom are women, the average compensation is $695,269 for the women over that span, compared with $710,775 for the men, a difference of 2.2 percent. In 2015, 14 of the 24 women's players earned more than $300,000 in salary plus benefits, and no one earned less than $249,000, according to federation numbers, adding that the top male player earned just more than $178,000 in salary in 2015. USSF chief financial officer Eric Gleason said the USSF numbers also show that for the past eight years, there has never been a year in which the player-compensation-team-revenue ratio was greater for the men than for the women. 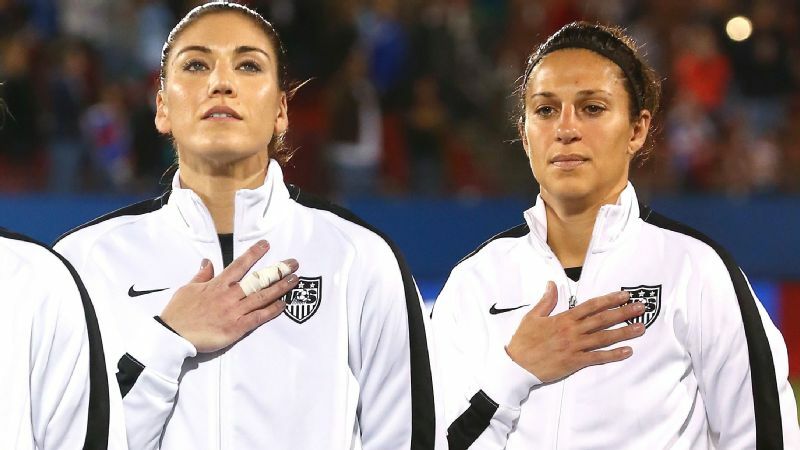 The USSF's disclosure of its fiscal summary for the past eight years, which covers event financials, advertising expenses and player compensation for both the men and women, came in response to charges filed three weeks ago with the Equal Employment Opportunity Commission by veteran players Hope Solo, Carli Lloyd, Alex Morgan, Megan Rapinoe and Becky Sauerbrunn. The U.S. Soccer Federation is disputing the claim that the women's national team players are compensated unfairly in comparison with the men. The USSF says it has not yet received a formal charge from the EEOC. The discrepancies between the genders, the sport's governing body told espnW, are not due to discrimination but rather in large part to the different pay structures for the men and women negotiated in their respective collective bargaining agreements. While the women are paid annual salaries plus benefits, the men are paid per game by the USSF, which requires them to be called into camp by the head coach. 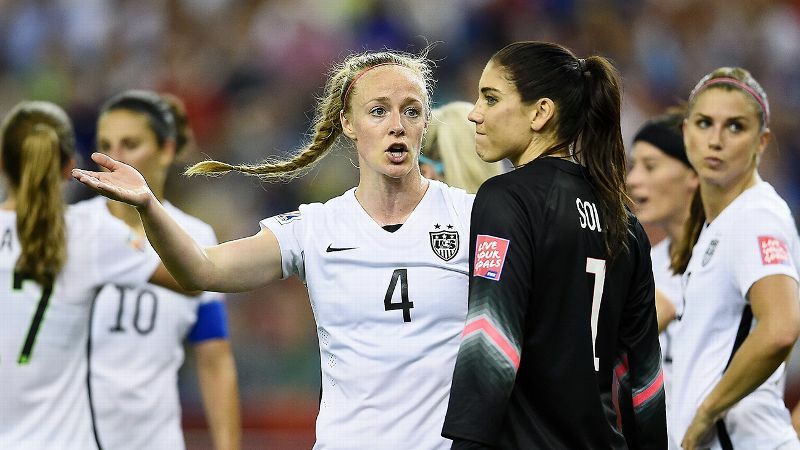 The women's complaint cited the USSF's 2015 financial report, and Jeffrey Kessler, the players' attorney, has contended that the women's team generated $16 million in revenue, whereas the men's team lost $2 million. The USSF's data, however, says that $16 million is the difference between the revenue budgeted (approximately $7.5 million) and how much revenue was actually generated ($23.5 million). USSF figures claim the men generated just more than $21 million, which is $4.8 million more than projected. 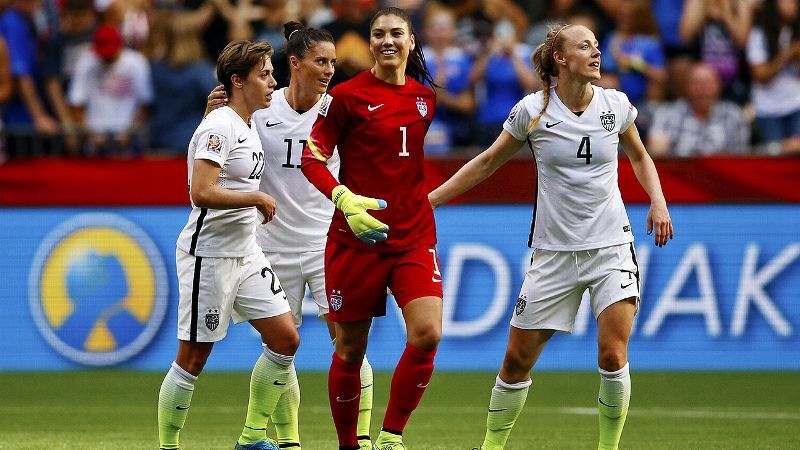 It's the first time the U.S. women's national team brought in more money than the men in a calendar year. Kessler said the numbers they gave to the EEOC "came 100 percent either verbatim from [the USSF's] published financial statements or from the collective bargaining agreements. ... If they have new numbers, they need to explain why they're different than previously published." The USSF charges that it's unfair to use examples from 2015, the year the U.S. won the Women's World Cup, and that projections for the future must take into consideration non-Olympic and non-World Cup years. If the U.S. women, for example, do not win the Olympic gold medal this year, they would not have as much opportunity to generate revenue in 2017 and 2018. But Kessler held firm that it would make less sense to use numbers from "three or four years ago." "We're dealing with discrimination today, so the most relevant figures are from last year and projections for this year," he said. The U.S. women point to the fact that Tier 1 women's players, who made up the majority of World Cup roster, made a base salary of $72,000 in 2015, whereas the men earned more than $5,000 per game, which over the course of 20 games would exceed $100,000. But the USSF claims that is also an unfair comparison. The federation said that of the 49 men who played for the national team last year, none played all 20 games, only three played more than 13 games, and only 11 played in 10 or more. All Tier 1 women's national team players, meanwhile, earned $72,000 regardless of the number of games they played. In addition, disparities in such areas as per diems and ticket revenue share -- members of the U.S. men's team receive $1.50 per ticket and the women receive $1.20 -- are the result of the different CBA cycles, the USSF said. The current men's CBA covers two four-year cycles (each a "quad") from 2011 to '18, whereas the current women's CBA covers one cycle from 2013 to '16. When the four-year term of the women's agreement started in 2013, the federation said the per diem for the women were made equal to the men's at that time. But as part of the men's agreement, financials such as the per diem increased from the first quad (2011-2014) to the second quad (2015-2018), creating the discrepancy. The federation added that this will be corrected in the upcoming negotiating cycle, which is scheduled to begin next year, and it will include language in future CBAs to prevent this kind of discrepancy. Also skewing the compensation numbers for men and women, the USSF claims, is the allocation of World Cup bonuses awarded by FIFA, soccer's world governing body. For example, FIFA provided $2 million to the USSF for the U.S. women for winning the World Cup last year, the majority of which was passed along to the players, the USSF said. Germany, the men's champion, was awarded $35 million. When the U.S. men's team advanced to the second round in 2014, it earned $9 million in FIFA bonuses. But Kessler said the USSF can allocate the money however it wishes. "They can't use the excuse that FIFA gives more money to the men than the women," he said. "That's FIFA's problem. In Australia maybe that's justified, but not here." The rancor between the players and the federation surfaced publicly after the USSF filed a lawsuit against the players' union earlier this year seeking confirmation of the validity of the CBA. The union claims its agreement from March 2013 can be terminated at any time; the federation maintains it is valid until Dec. 31. Kessler rejected the suggestion that the women's charges of wage discrimination were in response to the USSF lawsuit. "It had nothing to [do] with their lawsuit. Zero," he said. "They brought the lawsuit because they're obviously afraid of the women having the right to strike." The earliest resolution on the USSF lawsuit would take place sometime this summer. If the federation wins that decision, the CBA would prevent the U.S. women's team from striking.